Historic home renovations can be a challenging but incredibly rewarding endeavor. The architectural history of the United States is relatively young, and one of the best things you can do to create an architectural legacy in this country is remodeling an old house rather than tearing it down and starting from scratch. But be forewarned: Whole home renovations are almost always bigger projects than homeowners anticipate, and that can go double for historic homes. Here are the five biggest pitfalls you’ll want to avoid if you’re interested in historic home renovations. 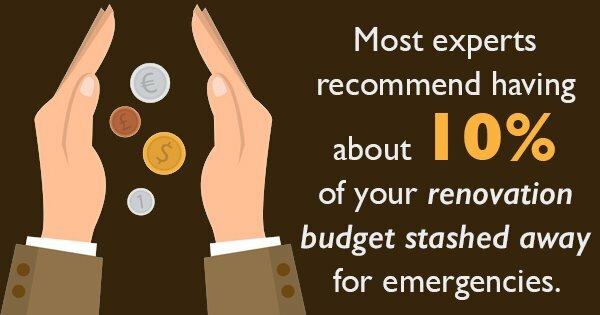 It’s always smart to have a contingency fund when you’re planning a renovation (most experts recommend having about 10% of your budget stashed away for emergencies). But that’s even more important when you’re planning to restore a historic home. Numerous unforeseen circumstances may arise, and you often will want to spend more on finishing than you expect in order to match them to the older elements of the house; nothing looks tackier in a 200-year-old Colonial than laminate countertops. Don’t think you have to sacrifice modern comforts in an older home — and don’t think that buyers will be willing to, either, if you anticipate someday putting the home on the market. Pay particular attention to adding all the newest conveniences to the kitchen and bathrooms. Bathroom remodeling is the most requested job in the U.S., according to the National Association of Home Builders (78% of renovations), and kitchen remodeling comes in second (69%). It’s true that these kinds of renovations can be pricey; nearly four out of every 10 home improvement dollars have gone into kitchens in the past five years. But they also have the potential to add quite a lot of value to your home. Older houses tend to have lots of little rooms that don’t match up with modern lifestyles. Ask your builders which walls are structural, or “load bearing,” to figure out whether it would be easy to knock down a few walls for a more open layout. Structural walls can be moved, of course, it’s just a more expensive and labor-intensive project. It’s easy to make plans to renovate by painting and changing up decorative elements. But you’ll also need to make sure that the things you can’t so easily see — old wiring, inadequate insulation, mold, asbestos, wood rot, lead paint — are properly dealt with. In the long run, it’s an investment in both the longevity of the structure and your safety. If you haven’t yet bought the house you’re planning to renovate, consider hiring a home inspector who has experience with historic homes before you sign your mortgage. Trying to Fix Every Tiny Imperfection Old houses have quirks, and you’ll need to embrace them. Yes, that means that something might not be perfectly centered because of where the old radiator pipes were. But that’s just part of the charm of an older home. Do you have any advice regarding historic home renovations to share? Join the discussion in the comments.